During the latest round of the Scavenger Hunt, I did all 7 entries in the style of comic book covers, and used action figures as the main subject matter. You can see all my entries here, but I wanted to go in depth to give a bit of a behind the scenes look into how I created these images. I picked the image for the word "Photographer" as it is one of the most straight forward ones. These are very complex shots, so I can't show every last detail. All told there are over 50 layers, adjustments, effects, and filters, spread out over 5 smart objects. A lot of detail. However this should cover the basics. The concept for the word "Photographer" was gear acquisition syndrome - something that plagues many photographers. Many of us always want the latest and greatest equipment. It is a real problem. With that in mind I dug into my toybox. I fixated on Danbo, the Amazon.com themed action figure. I decided to capture the joy of opening that box and pulling out new gear. I settled on Captain America for two reasons. 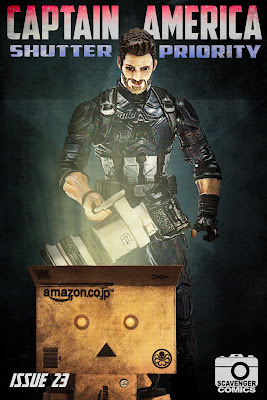 First, I hadn't used him yet in my work, and second he is one of the few action figures that has a normal looking face. Since the emotional reaction was important, having a recognizable folks can empathize with seemed important. I tossed the figures into a light box, and took the basic shots. That and some textures from my library, and some clip art, and I was ready to assemble my image. The comic logo I created and used on all my images for this round. I tossed a bunch of layers into an animated gif so you can see how I went thru the process of constructing this image. All the text was done with the Photoshop text tool, and adding some effects. 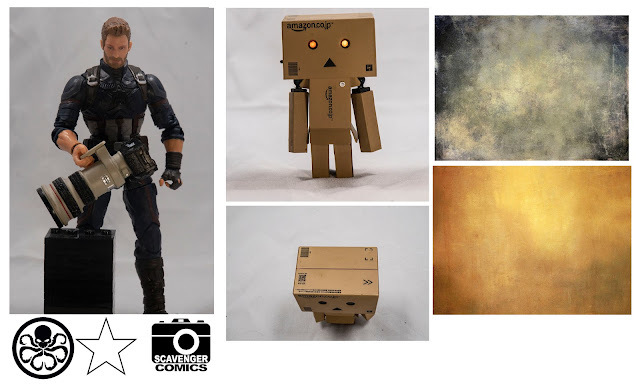 The comic book effect on Cap and Danbo was done with a combination of the Poster Edges, Glowing Edges, and Color Halftone effects. Pro Tip: This is where smart objects become your friend. I did adjust Caps face with the liquify tool to add a bit of a smile. No plugins were used in the creation of this image. So now you know how the magic is done. You have no excuse for not creating your own. Good luck!